This ebook is really beautiful. The way he teach the patters clarify everything you need to go out and perform. I tricked my professor with his patter. Just choose your best patter for each person. Paul Voodini has excellent material as far as I can tell. In his ebook, Mark of the Devil, his effect, SECRETS of the MAYANS is worth it's weight in gold. There is quite a bit of memorization to do but the effect is tremendous. You can use a marked deck of cards, a simple card force, or stacked deck etc. with this routine. My opinion is to but the ebook and go online to find a cheap Mayan coin to do this GREAT effect. When I got this on a whim, I just chuckled. A marked deck's a marked deck. Once you figure out how to read the markings, what else do you need? This was going to be a nothing read. Then I started reading and immediately realized that that au contraire, any fool mentalist can figure out someone's card with faux-mind reading shenanigans like "I'm seeing a black..no, wait a red card. 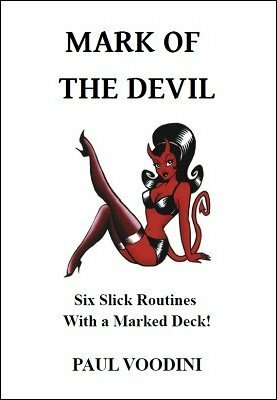 You are thinking of a red card..." This book has some cool ideas to clothe your naked marked deck routine in. Is it a world beater? No, and unlike Paul Voodini when he was younger, you aren't going to base your entire show on marked deck routines. But this is a solid book with six good routines for a little over a buck each.